While in New York City after a gig at Madison Square Garden, Bob Marley learned that he had terminal brain cancer. He headed to Pittsburgh anyway, travelling by bus with his band The Wailers for a gig at the Stanley Theater two days later in what turned out to be his final concert on September 23, 1980. On that same day 32 years ago I also road tripped to the Stanley Theater to be at the show, although nobody in the crowd knew what the world would learn soon after, that Marley was very, very sick. I was a sophomore at Kenyon College in Ohio at the time. Having grown up a rock kid in the suburbs of New York City, I was already a concert veteran by then, having caught dozens of bands like Led Zeppelin, Aerosmith, The Ramones, Black Sabbath, Frank Zappa, and the Grateful Dead plus classic blues artists like Muddy Waters and Albert King. But when I first heard Bob Marley blasting from my friend Ned’s dorm room at the beginning of freshman year, it was like nothing I had heard before. I was hooked and bonded immediately with the others partaking in Marley’s music and all that goes with it. My friends and I just had to be at that Stanley Theater show, so we drove four hours to catch it. For some reason, I felt compelled to borrow a friend's excellent camera outfit complete with telephoto lens. It was a cosmic thing because I had never brought my own camera to a show before. Since the big Canon looked "official" back in the days of film cameras, the staff let me fire away from anywhere I wanted. Somehow I managed to focus the unfamiliar camera even though we had "prepared" for the show for the entire drive. The show was epic. The i-Threes opened (Marley's wife Rita Marley, plus Judy Mowatt and Marcia Griffiths) and I still recall them swaying in time to the music. They did three songs before Bob came out to thunderous applause. He was dancing the entire 90 minute show except for the acoustic "Redemption Song" which he performed laid back and solo. They did three encores as if Bob just didn't want to leave the stage. Nobody in the audience knew that Bob was sick. His energy level was extremely high and he had total command of the audience. My resulting photos didn't see the light of day for several decades. Then 2 years ago, the Marley family released a live album of that Stanley Theater show. When I noticed that the photos used in the live album packaging were not actually from the Stanley gig, I left a message in my Amazon review of the CD: "If anyone from the label reads this, I have some great photos from the show." Little did I know that a film was in the works from Academy Award-winning director Kevin Macdonald. "One of the challenges with Bob is that there's so little great archive footage," says Macdonald. Marley's last show was a critical aspect of the film and there was no video or photo record... except mine. The weird vibe of borrowing the camera and reviewing the CD came full circle when the filmmakers, who had read those reviews, contacted me. I'm not trying to make a marketing lesson out of this story, but had I not posted content in the form of that Amazon review of the CD, the world would never have seen photos of Bob Marley's last concert. "Of course you can use my photos!," I said. And for a little added ego boost, I got a credit in the film. In the trailer, the first two stills are mine. Direct link to "Marley" trailer on YouTube. "Marley" is a terrific film even if you aren’t a fan. My wife watched the screener with me and she loved it too. Bob Marley's universal appeal, impact on music history and role as a social and political prophet has only grown in the past three decades. "Marley," is the definitive life story of the musician, revolutionary, and legend, from his early days to his rise to international superstardom. Made with the support of the Marley family, the film features rare footage, incredible performances and revelatory interviews with the people that knew him best. Bob Marley's music became an important part of my life. So much so that on a visit to Jamaica in the mid-1980s, I even traveled several hours by car to Bob's childhood home in the village of Nine Mile in Saint Ann Parish. 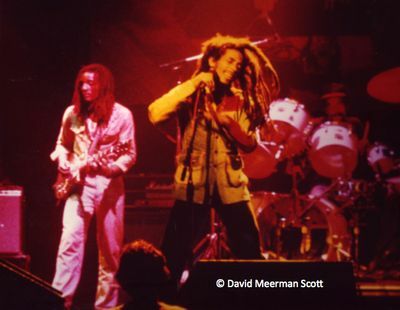 "I think what's great about the film," says Bob's oldest son, David "Ziggy" Marley, "is though there's been a lot of things done on Bob, I think this one will give people a more emotional connection to Bob's life as a man. Not just as a reggae legend or a mythical figure, but his life as a man, you know? The struggles he went through." Ziggy is right. 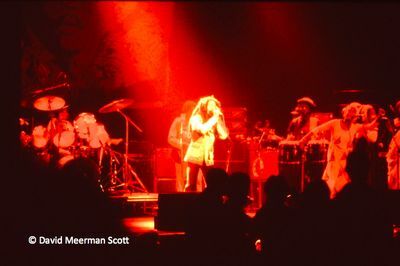 The film does provide an emotional connection to Bob Marley. I'm amazed that through some remarkable serendipity and cosmic 420 vibes, I played a small part in bringing this story to the world.